Kim Hyun Joong returns from New Zealand with a win under his belt, having guided his mount to victory in the final race of the Asia Young Guns Challenge at Te Rapa Racecourse on Saturday. Finishing among the also-rans in the first two heats of the three-race series meant Kim didn’t finish in the top three overall in the Challenge, which was won by Harry Kasim representing Singapore. However, the Busan-based jockey made it a day to remember as he rode Aussie-bred Seams Like Magic (Duelled) to a narrow win by a head in the mile-long race. 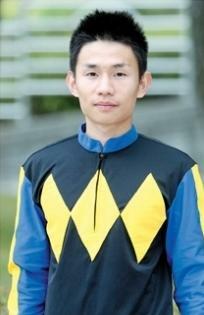 Kim Hyun Joong qualified as a jockey last year and has ridden 16 winners at Busan from 269 rides. It’s the second year in a row that a young Korean jockey has performed well at Asia Young Guns after Seo Seung Un’s overall third-place finish last year. The Asia Young Guns Challenge, which brings together some of the Asia-Pacific region’s most promising young riders, will be held in Korea in 2015. Jordan Childs didn’t get a win for Australia but it was a great meeting for the young jockeys with plenty of talent on show. In saying that Jordan rode a winner the day he returned to Australia. Good luck to all of the young jockeys.